It all started on the fateful day of March 13, 2019, with SNL's *casually leaves this here* tweet announcing their stint as the show's first K-pop (and South Korean act) musical guest — which was a Big Deal. It also continued BTS's streak of huge U.S. TV appearances, which includes The Ellen Show, Good Morning America, The Tonight Show Starring Jimmy Fallon, and The Late Late Show with James Corden, and you know, the Grammys. BTS fans weren't the only ones camping out, as evidenced in the first promo video — a sleepover in which host Emma Stone and the ladies of SNL collectively freaked out about the talented septet. However, it quickly sparked an online debate about their seemingly stereotypical portrayal of diehard teenage girl fans, while failing to acknowledge that BTS's fandom, ARMY — and fans of *any* boy group — is known to be super diverse in terms of age, gender, country, etc. Even though we all know SNL is obviously a satirical comedy show, it's still food for thought, ya feel. "No boys allowed," really?? If you want an in-depth analysis of BTS's hair colors over the years, you got it. Their first performance of the night was "Boy With Luv," a song that's been smashing records left and right since its release — one of the biggest being the most-viewed 24 hour debut in YouTube history. BTS also invited "Boy With Luv" co-songwriter Melanie Fontana to sing on stage with them, which is the darndest, cutest thing I've ever witnessed?? BTW, Melanie also cowrote “Mikrokosmos” off of their latest album, Map of the Soul: Persona (which is my favorite, and no wonder why!!! ), Jungkook's solo track "Euphoria" off of their Love Yourself: Answer album, ***and*** she's written for Britney Spears, Justin Bieber, Girls' Generation, and more. THE GIRL'S GOT TALENT. For their fierce Steve Aoki–remixed "Mic Drop" performance, the boys donned pieces from Virgil Abloh's Louis Vuitton and Off-White collections, futher solidifying their statuses as ~Kings of Fashun~. And the intersection of old and new fans...is just a place of magic and pureness. Here's another cute compilation because I can't resist. And this K-pop fan's hubby finally got the memo on BTS breaking cultural barriers *and* the front page of CNN. That's not all! 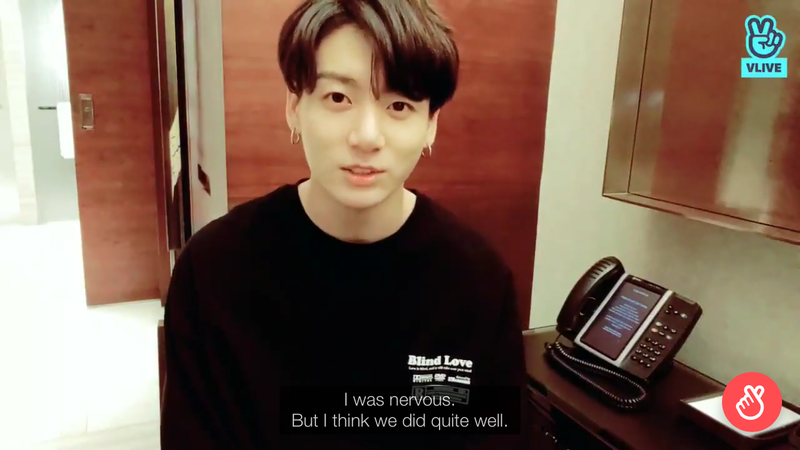 After the performance, Jungkook blessed us with a spontaneous Vlive stream, in which he reflected on the iconic performance, reviewed some of his SNL gifts, talked about the progress of his English studies*, and showed his love for ARMYs in both languages! *in part to alleviate some of leader RM's burdens in mediating/translating interviews — I'm not crying, you are. Also, super random, but the "Blind Love" T-shirt he's wearing makes me think that it could be a new song of theirs — like a follow-up to "Fake Love?" "Pied Piper" even? And since Halsey was at Coachella and couldn't share the SNL stage, the BBMAs announced the ~full~ BTS x Halsey debut live performance of "Boy With Luv!" Yes, you read that right. @BTS_twt and @halsey for the FIRST TIME EVER. #BBMAs are Wednesday, May 1 on NBC. Anyways, in the meantime, I'll be debating whether or not I should die my hair Tae Blue.